You don’t have to go the ocean to hear the best songs this summer! 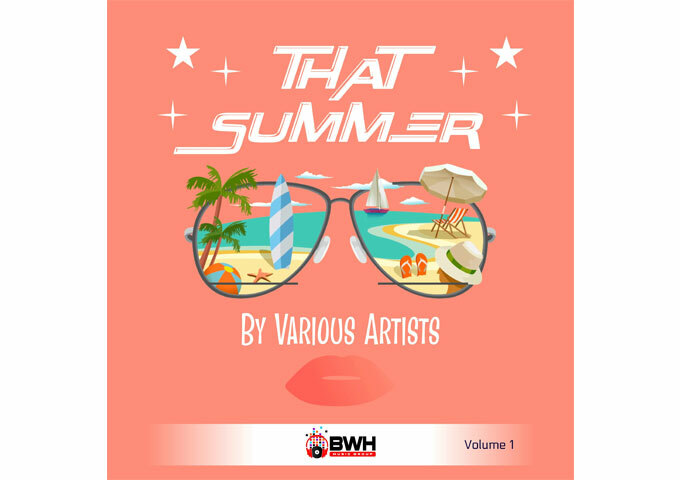 BWH Music Groups June, 2018 release titled That Summer, Vol. 1 by Various Artists is the hottest indie release of the summer and perhaps the entire year. This extraordinary compilation album features 15 songs by internationally acclaimed and award-winning artists in multiple genres. Featured artists include: Skinny Fresh, Coastal Club, C.K. & The Rising Tide, Frank Migliorelli and The Dirt Nappers, Ed Roman, Jeremy Parsons, Cole, Nina Amelio, Jenny Vinatieri, Erick Blu, 0 hype feat. Chris Chand, AntoineRNB, Natalie Jean & Levi Moore, Luna Keller, and The BeeKeepers. “All I Need- Winner of Emergenza (Switzerland), Skinny Fresh is on the rise with salient lyrics, impressive flows, diversified beats and a new interpreted, millennial-flavored boom bap that has landed him on the watch-list of several record labels. Skinny Fresh was discovered by Ives Irie of Delinquent Habits. Impressed by the skill and passion of the young Swiss lyricist, Ives Irie added Skinny Fresh to the Delinquent Habits European album tour. As the opening act, Skinny Fresh won over fans around the world. Make It By- This Queen City quartet of indie surf rockers was formed in 2016 by a group of friends looking to blend indie rock and pop with a dash of surf music. The name Coastal Club was inspired by the groups best memories of spending time at the beach with friends and family. While based in landlocked Ohio, there is a longing for the coast found in their romantic beach tunes. Their fun, reminiscent sound falls somewhere between bands like Hippo Campus and Vampire Weekend. Coastal Club released their self-titled debut EP in 2017. Friends – The Huffington Post states Flachs songs and his voice are mesmerizing. You have to listen. Driven by his fresh fusion of alt-country, indie rock and Americana, Hudson Valley, NY singer-songwriter C.K. Flachs insightful and provocative solo debut album Empty Mansions earned C.K. & The Rising Tide significant accolades, radio rotation and coveted festival slots. Red Omen – Ed Roman is an Award-winning singer/songwriter, performer and multi-instrumentalist from Shelburne, Ontario. Blurring the lines between pop, rock, folk, and country music genres, Eds uniquely crafted songs have received regular rotation on more than 100 terrestrial radio stations across North America and more than 400 stations worldwide. Ed is a 2014 Artists Music Guild Award Nominee, a 2014 International Music and Entertainment Association Award Winner, a two-time 2015 IMEA Award nominee, a 2015 and 2016 Josie Show Awards nominee, an Akademia Awards Winner and a two-time Indie Music Channel Award winner. Burn This House Down – Born in San Antonio, Texas, Jeremy Parsons grew up soaking in the sounds of the Lone Star state’s dance-hall music. Today, he tours stateside and internationally captivating audiences with his homegrown music, genuine personality, unique humor and a heart-felt love for his art. Jeremy is a Jersey Shore Film Festival nominee, a NCCC Film Festival finalist and a 2018 Josie Music Award nominee. “If im Really – Cole is an up and coming indie-pop singer-songwriter, recording artist, performer and multi-instrumentalist (guitar, ukulele and keys). She collaborated with a stellar team to release her debut self-titled album followed by her release of “Two Faced” which was co-written with Jenn Rykert. “Two Faced” was selected as a semi-finalist in the 2017 International Songwriting Competition (ISC) and charted globally on Digital Radio Tracker. Cole is recording her 2nd album and will be releasing singles throughout 2018. She tours from Texas to Nashville and she recently traveled to Anaheim, California and performed at the Anaheim Convention Center for the 2018 NAMM Winter Show. Cole is passionate about helping others through music and donates her time to many charities, benefits and fundraisers; she visits Texas Children’s Hospital often to perform for cancer patients and their families. Savage Love – British Columbia, Canada based Pop recording artist Nina Amelio has achieved enormous recognition and radio success. At present, Nina is on over 60 radio stations worldwide broadcasting in the UK, USA, Italy, Australia, Slovenia, Spain and New Zealand to name a few (15 broadcasts are on FM frequency). Currently Savage Love has over 400,000 plays on Soundcloud and has garnished international radio rotation. Nina won Singer Universe ‘Best Vocalist of the Month’ and was nominated for ‘Best Pop Song’ at the Hollywood Music in Media Awards. Nina is signed with Elite Management, Arrow and Spark (Arrow Music Agency in Seattle, Nashville and Los Angeles). Rainbow – Born in Italy and raised in Spain, Jenny Vinatieri is a singer-songwriter who currently resides in Colorado Springs, Colorado. Jenny is gaining recognition for her ability to write songs across many genres. She was the Grand Prize Winner of the 2016 Divine Tracks Contest and a semi-finalist in both the International/Unsigned Only and the USA Songwriting Competition. Victorious (Ansimatik Remix) (Official Dance Anthem) – Erick Blu is an award winning Pop music sensation. In his young and rising career, Erick has already performed in front of 20,000 people sharing the stage with American acts such as Hoobastank. He also took center stage promoting his refreshing, positive message at the World Scholars Cup in 2010 where he won Best Pop Performance. Erick is now an official member of The Recording Academy with his songs in consideration for the 60th Grammy Awards. Erick won The 2017 Akademia Music Award for his song Took The Words for Best Pop Song and an American Music Award for Best International Song which can be heard on his Vevo-Certified channel crossing 1million hits. Ease My Mind (feat. Chris Chand) – Rudi Jubran aka “0 hype” is a hip-hop artist from Toronto, Canada who was born and raised in Scarborough. He released his much anticipated full length, 14 track project title Before You Enter displaying his versatility and skill as an artist. With a capable range of sounds and genres, 0 hype approaches rap with a raw, steady, spoken word inspired flow breaking the current meta of the Toronto sound. Let Me Live – AntoineRNB is a singer-songwriter, rhythm and blues artist from New York. His unique contemporary, urban style was described best by Spate Magazine (the number one Hip Hop News Blog in the Country) as the future of urban contemporary music. His style is original, soulful and funky. Antoine has received airplay on FM Radio around the country and positive press from major hip hop/ R & B magazines. AntoineRNB is signed to the Independent Record Label, TRAK TO THE FUTURE. The Letting Go – Natalie Jean is an award winning, multi-nominated singer/songwriter and performer. She sings many genres, such as Jazz Pop, R&B, Blues and Dance and can also sing in French, Spanish, English, and Creole. Natalie Jean has been nominated over 60 times for her music and has won many awards. The Letting Go won a Silver Medal in The Global Music Awards for Best Country Song. Most recently, “The Letting Go Music Video” received a Silver Medal in the Global Music Awards and won for Best Music Video of the Month in the Aab International Film Festival. The Letting Go has been nominated in the 2018 Atlas Elite Entertainment Music Awards for best country song and for Best Americana Song in the 2018 Clouzine International Music Awards. Natalie Jean has released five albums thus far. Packing My Bags – Luna Keller is a young singer-songwriter who has released seven singles in a short period of time to critical acclaim. In the music review blog Wolf in a Suit, Luna is described as having an exquisite and mature showcase of lyricism. National blog, Indie Brew, states, you will find yourself returning to Luna’s music over and over again. That Summer, Vol. 1, by Various Artists can be purchased on all major digital outlets. BWH Music Group is a full scale collaborative record label. BWH Music Group works with today’s best independent artists to achieve common goals in sound and promotion. BWH Music Group offers Recording Services, Record Releases, Promotions and Radio.